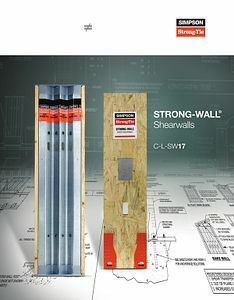 The C-L-SW17 is a 100-page catalog for the Strong-Wall® shearwalls, including the new Strong-Wall® wood shearwall. It contains product data, engineering design information, installation and anchorage details. Expires 07/31/19. This piece SUPERSEDES C-L-SW14. All Simpson Strong-Tie Strong-Wall shearwalls are now code-listed to the 2015 IRC/IBC. Both the Simpson Strong-Tie Wood Strong-Wall shearwalls and Wood Strong-Wall SB shearwalls conform to ICC-ES Acceptance Criteria AC130. See ICC-ES ESR-1267 for the Wood Strong-Wall and ICC-ES ESR-2652 for the Wood Strong-Wall SB. The Steel Strong-Wall shearwalls conform to ICC-ES Acceptance Criteria AC322 and are code-listed under the 2012 IRC/IBC (see ICC-ES ESR-1679). The Strong-Wall® Prescriptive Design Guide is also available! In this document you will find solutions for projects located in wind and seismic areas. It includes detailed anchorage solutions for both cast-in-place and adhesive anchors. There are solutions for concrete, concrete masonry unit (CMU) foundations and wood floor — the most wall bracing design options of any prefabricated shearwall manufacturer.